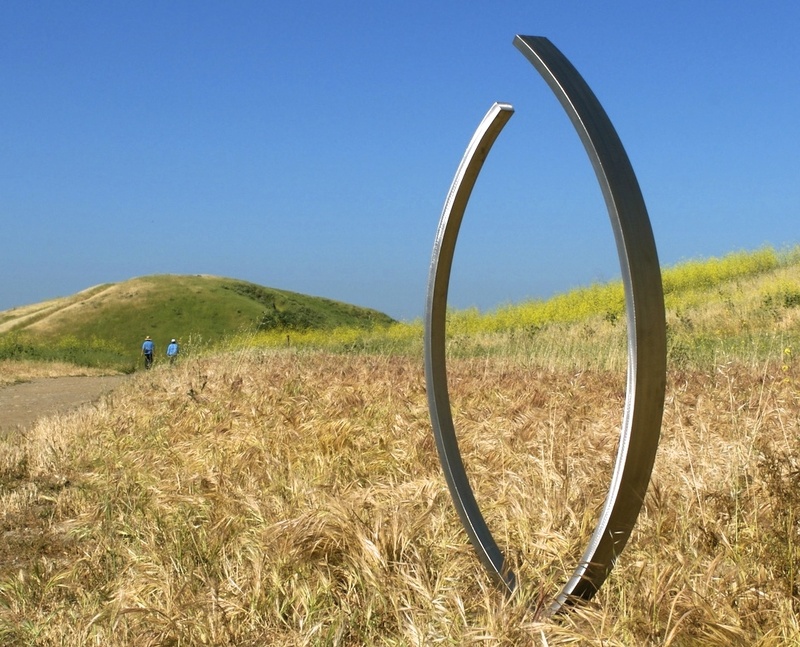 What happens when you visit a public or private sculpture garden or an expanse of land that has art on view in an outdoor setting? Does the visitor have to work harder to enjoy or experience the art when the setting is natural? 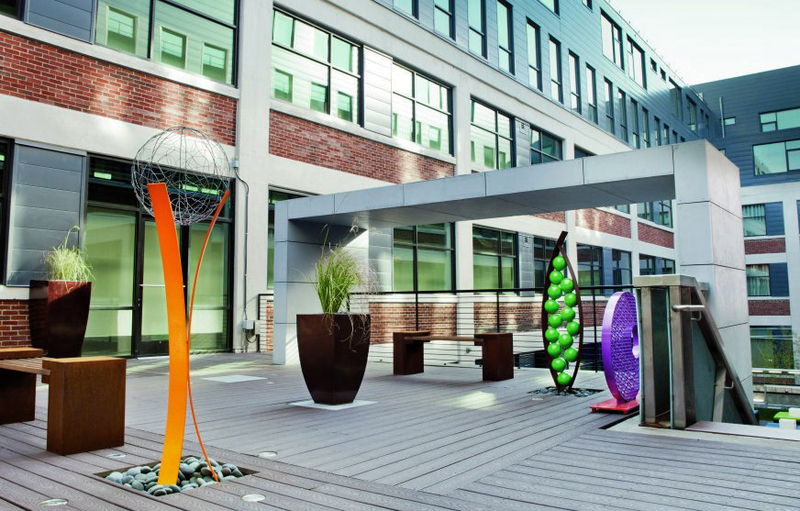 Does the sculpture interact with the surrounding natural environment to create a new, transformative experience? Embrace, by Terra Sculpture, set in a public open space. For some, public landscape art provides a quiet and contemplative respite from noisy urban areas. 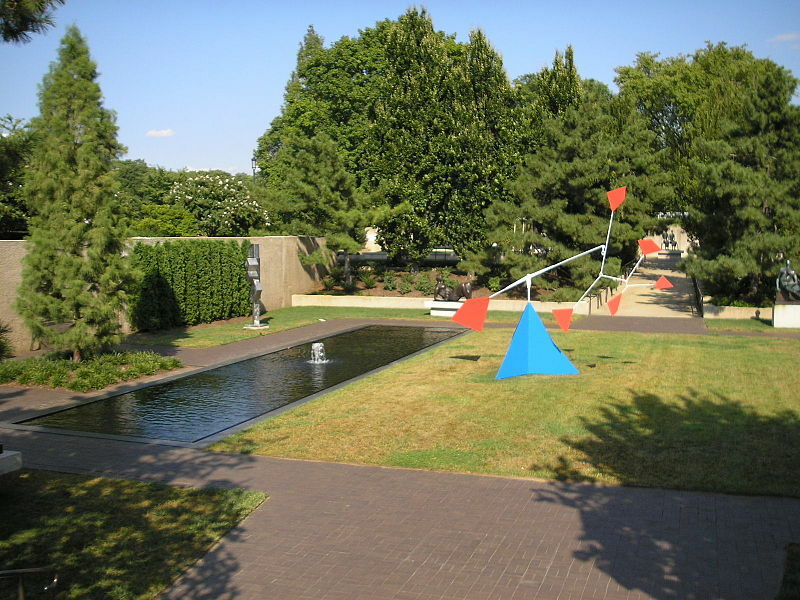 For others, a public sculpture garden is an extension of an indoor space or gallery like a museum, where larger substantial pieces of art can be viewed without the typical constraints of walls and crowds. 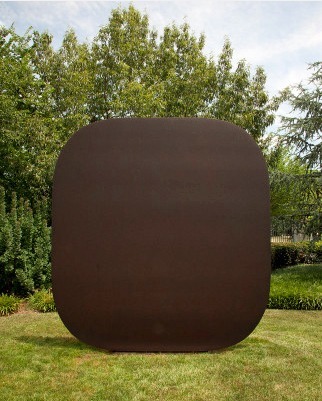 Across the U.S. there are extraordinary outdoor environments to experience landscape sculpture including the Storm King Art Center, the deCordova Sculpture Park and Museum , the J. Paul Getty Museum and the Nasher Sculpture Center. Alexander Calder’s Six Dots Over a Mountain kinetic sculpture in the gardens of the Smithsonian Institution, Hirshhorn Museum & Sculpture Garden, Washington, D.C. 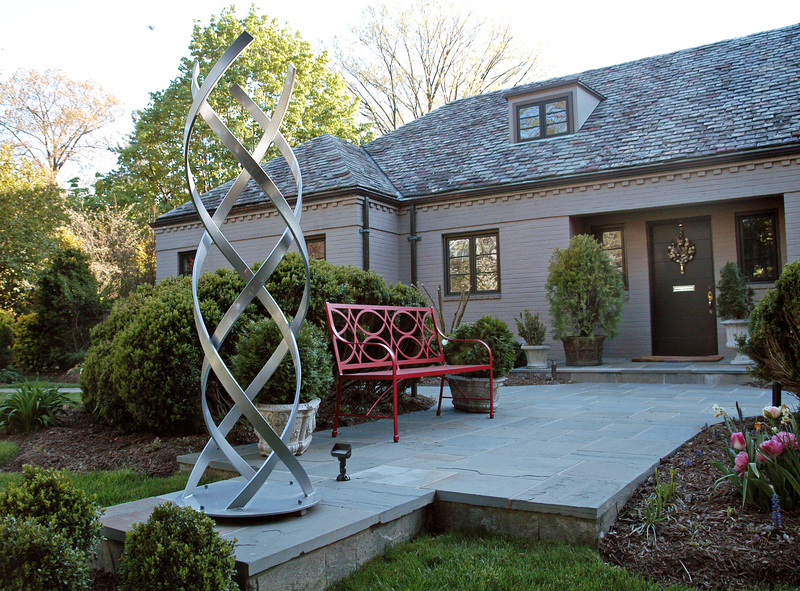 There is no doubt a great love and appreciation for outdoor sculpture in Washington D.C. As artists, we are fortunate to have many sculpture commissions and installations in the Washington D.C. area in both private and public settings. As we have thought about how our pieces interact with the environs of our clients’ settings, we can’t help but also wonder how the public interacts with art in an outdoor public space. Tempest, Snap and Verita, art works by Terra Sculpture, on view outdoors in the public art space at the Foundry Lofts in Washington D.C.
Kismet, a stainless steel sculpture by Terra Sculpture, on view in the garden of a private residence near Washington D.C.
One of our favorite places to experience outdoor sculpture is the The National Gallery of Art Sculpture Garden in Washington DC. The outdoor gallery resides on 6 acres adjacent to the National Mall and contains 18 pieces of original art. The garden was designed by Philadelphia-based landscape architectural firm OLIN in 1999 after the property’s jurisdiction was transferred from the National Parks Service to the National Gallery in 1991. 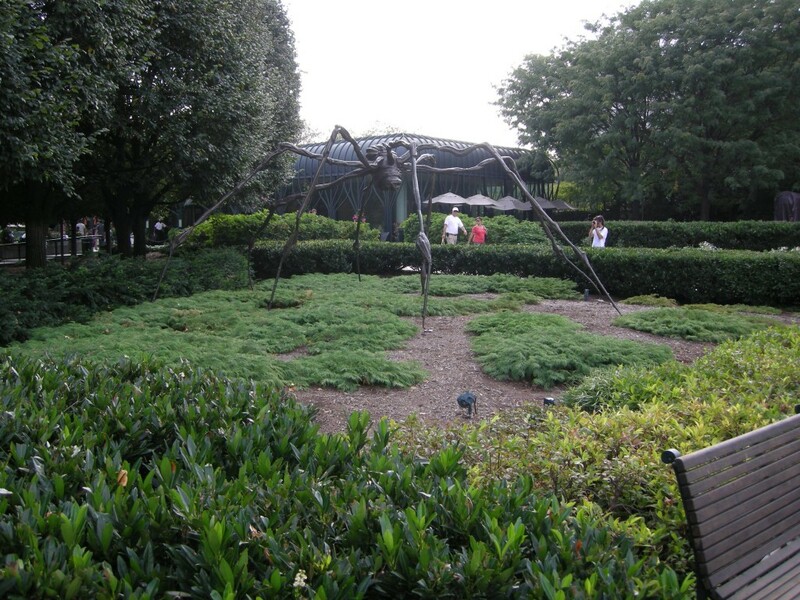 When we visit the garden, we appreciate the garden’s structural bones, the soft grass berms, the well-placed understory shade trees, and the benches that provide perfect vantage points from which to enjoy these oversized marvels like Spider by Louise Bourgeois. The variety of art that the sculpture garden supports is wide and is made up of post-WWII pieces. 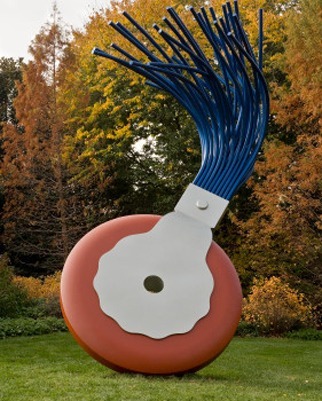 Installations include Ellsworth Kelly’s Stele II, Claes Oldenburg’s Typewriter Eraser, Scale X, Joan Miró’s Personnage Gothique, Oiseau-Eclair, and Roy Lichtenstein’s House I. Lead architect Laurie Olin created each room to provide a comfortable enclave for visitors to rest and reflect, using American trees and shrubs to define the space. Stele II by Ellsworth Kelly – Outdoor Sculpture Garden, Washington, D.C.
Typewriter Eraser, Scale X by Claes Oldenburg, Outdoor Modern Art at the National Gallery of Art, Washington D.C. Whether experienced in a walled gallery or in the open space of a sculpture garden, the power of art is it’s ability to manifest an idea, emotion, or a concept. The expression of an outdoor sculpture can be comforting or disturbing, revelatory or transformative. The presence of a sculpture in the landscape is undeniably impactful.